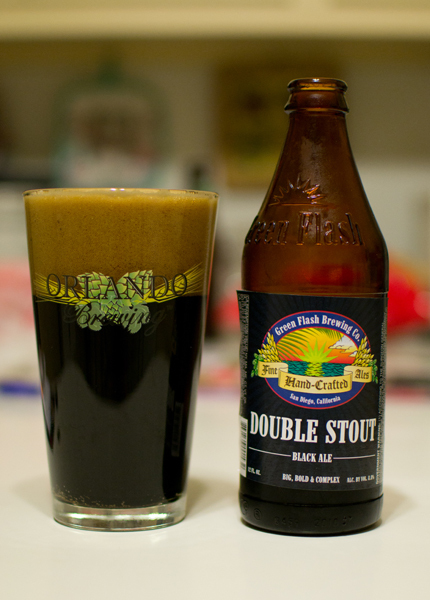 Beer #351 is Double Stout Black Ale by Green Flash Brewing Company from San Diego, California. This American Double/Imperial Stout has an ABV of 8.8%. Appearance – The color of night…black. The head was huge and creamy and light brown. Nose – Dark chocolate, dark roasted coffee, vanilla and a bit of smoke. Taste – It starts off bittersweet with dark chocolate. It had a nice dark roast, slightly sweetened coffee flavor towards the back end…almost like a bitter mocha coffee drink from Starbucks. There was a very subtle burnt or smoky thing here also…but it was really in the background. The ABV was hidden very nicely here. Mouthfeel – Medium bodied, light carbonation, & quite smooth. Overall – This was very nice. With dark chocolate being my favorite of all chocolates and my love of coffee, this was right up my alley. I’m a biking fool lately…thoroughly addicted I am to the trail, my bike (Salsa El Maricahi), the sounds of nature, and the solitude. Oh yeah…the speed one can get going down inclines is quite thrilling also. I happened on a hawk or possibly an owl in my riding today that had an unfortunate victim (rabbit?) in its talons as it flew skyward. Another 16 miles at my favorite place to ride, Six Mile Run Reservoir, made me a happy camper. 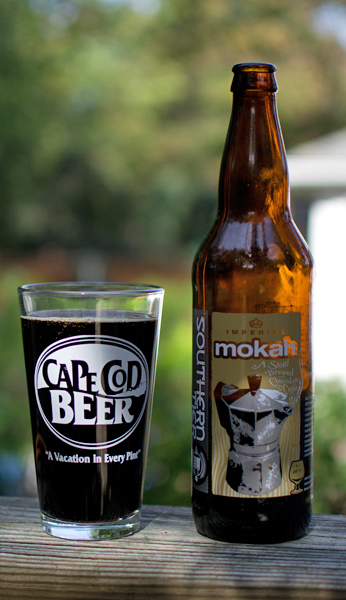 Beer #316 is Mokah by Southern Tier Brewing Company. I have been looking forward to this American Double Stout or Imperial Stout brewed in Lakewood, New York for quite some time. The ABV clocks in at a heavy 11.2%. Mokah poured black with a very thin brown head. The nose was fantastic…chocolate and coffee and cocoa. It smelled like hot chocolate or more like a mocha coffee drink…yum! It tasted exactly like it smelled with the coffee and the chocolate mixing together very nicely. There was a bit of vanilla mingling in with some nice roasted malty flavors. It reminded me of how I like my mocha coffee drinks, not overly sweet with a nice bitter cocoa/chocolate flavor. It had an excellent aftertaste of cocoa powder…damn good. It had a heavier body but not really thick. It was quite smooth and creamy with lower amount of carbonation. I thought the alcohol was hidden fairly well for such a high ABV brew. I loved this…it was quite delicious! Coffee and chocolate lovers should seek this out. This is by far my favorite Southern Tier brew I have had so far! Tonight is the last night of the MLB regular season and the Yankees (in the playoffs…again) are doing their best to eliminate those pesky Tampa Bay Devil Rays….oh…sorry…can’t say Devil now a days. I wish there was a way the Yanks could also eliminate the Red Sox. I just have this feeling the Red Sox are going get things going again. Maybe we will see a Yanks/Red Sox ALCS? 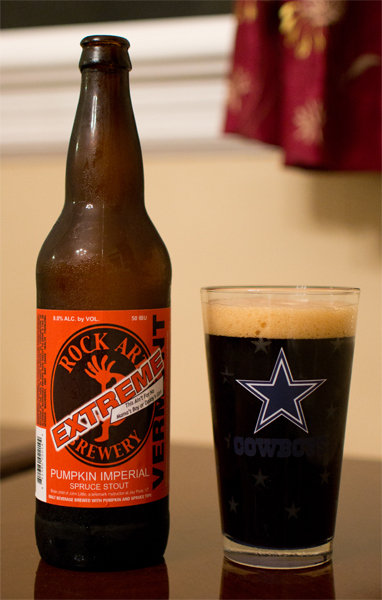 Anyways…on to beer #304, Pumpkin Imperial Spruce Stout by Rock Art Brewery brewed in Morrisville, Vermont. This is brewed in the style of an American Double or Imperial Stout with an ABV of 8%. Of note here is that this is brewed with pumpkin and spruce tips just like in colonial times for flavor and bittering. I love the little saying on the label…”This ain’t for no mama’s boy or daddy’s girl”. It poured black as night with a one finger width tan head. It had a vegetable like aroma (must be the pumpkin) along with the typical Stout smells of chocolate and coffee. It started off with a pine like flavor from the hops and then got into some roasted, almost burnt coffee flavors from those lovely malts. There was an herbal quality to the flavor also. It had a decent bitter bite near the end of it. I didn’t get anything in the taste resembling pumpkin. It was lighter in the body that I was expecting being somewhere between medium and light. The carbonation was fairly low and the alcohol was hidden very well. For me, this was pretty average. I was expecting the pumpkin to make a bigger splash here taste wise and it just didn’t. It showed in the nose though. I still love Rock Arts use of Kokopelli though. Imagine my surprise when just the other day I get an email from a co-worker asking “What do I want?” with a picture of a menu. The menu was from the Dogfish Brewpub in Rehoboth Beach, Delaware. A big smile came across my face as I was pondering what I should ask her to bring back for me, in a growler of course. Two options instantly stuck out, Festina Peche and Black & Red. Not one to turn down an offer of fresh craft beer, those were the two I asked for my willing co-worker to bring back from the far off lands of Delaware, home of tax free shopping! 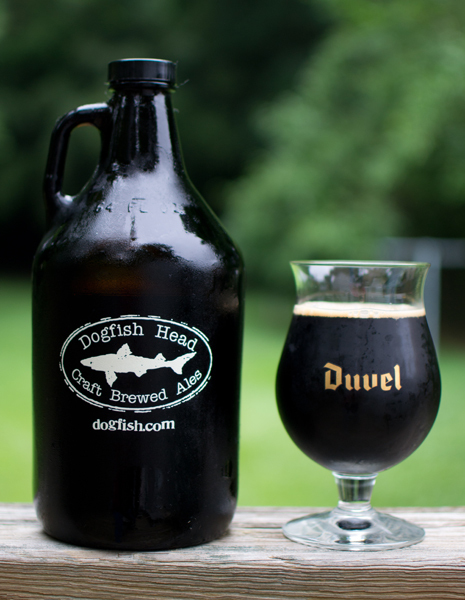 Lets pop open the sealed cap of the Dogfish Head growler (1/2 gallons of liquid heaven) for beer #208…shall we? I went with the Black & Red, which is an American Double or an Imperial Stout brewed by our friends at Dogfish Head in Milton, Delaware although it may be brewed at Rehoboth Beach as I think they do brew there also. The ABV clocked in at a lofty 10.5% which made me wonder if Dogfish brews anything on the lighter side alcohol wise? I broke out my Duvel tulip glass for the pour, went to my backyard deck armed with camera in hand, poured, and snapped a photo or three. It was black (how much more black could this be? And the answer is none…none more black) with just a touch of a reddish color when held up to the light. The head was disappointing (I’m not a fan of a lackluster head…is there anyone who is? ), it was just a small tan ring that topped the beer. Off to take a whiff I went and I was rewarded with an awesome bouquet of mint, chocolate, raspberries, roasted malts, and coffee. Interestingly enough, for such a high ABV, there was no alcohol aroma to be found. I took a sip, one word yum! The raspberries and mint chocolate hit you first and foremost and last throughout the taste profile. Towards the back end of the sip I got some nice roasted malts reminding me of coffee. Once again, the alcohol did not make itself noticeable in the taste. So how was the mouthfeel you may ask? Why it very smooth and creamy. It was very filling and had low carbonation. The alcohol finally kicked in after the first glass full even know I took my time with it. It is going to be one happy time in the old house tonight for sure! As I sit here with the rain falling gently outside my window and I compose this blog listening to 80’s hair metal (Ratt, Dokken, etc.) cranked to 11 I think to myself, this was absolutely delicious. It just tasted so damn good with nothing out of place or too overpowering. I don’t think you can get this anywhere other then the Dogfish Brewpub in Rehoboth Beach…but if you are there…and it is still on tap…give it a go…I’m sure glad I did! A big Thank You to my fellow co-worker, you know who you are, who was kind enough to bring this back for me. I raise a glass or three to you! Have a great weekend all…and to all a good night! 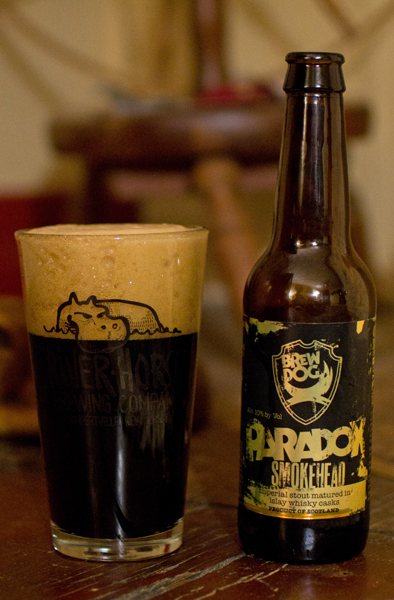 Beer #186 is Paradox Smokehead Batch 15 by Brewdog. I really wanted to like this but the smokiness was a bit overpowering (odd since I absolutely loved beer #57, Aecht Schlenkerla Rauchbier Weizen). The smokiness overtook everything nose and taste wise. It just wasn’t all that enjoyable for me. 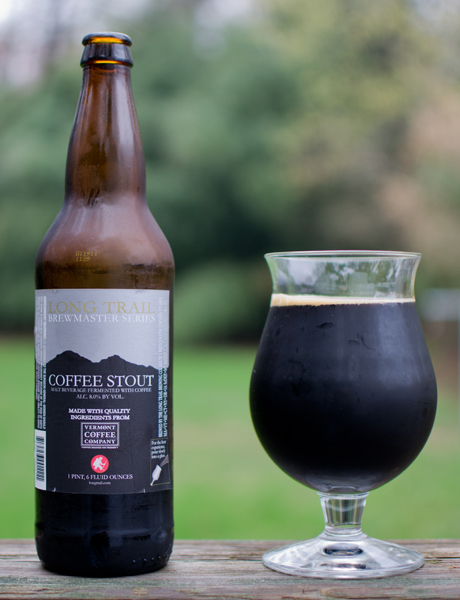 Lets head to Vermont for beer #146, Coffee Stout by Long Trail Brewing Company. This American Double Stout/Imperial Stout is part of their Brewmaster Series. The ABV clocks in at 8%. Black was the color…how much more black? The answer is none more black (props if you know what classic movie that is from…). No head…damn, though I may have poured it too gently. Coffee, coffee, and more coffee in the nose. There was a smell very similar to coffee grounds after a good cup has been brewed. I also got a bit of alcohol. Again, the coffee was upfront (with just a hint of chocolate…reminded me of a mocha from Starbucks) in the taste along with some roasted malt flavors and a bit of caramel. There was a nice smoky, slightly bitter finish to this. This wasn’t as creamy as I was expecting (a bit on the harsh side) and not nearly as heavy as the appearance leads one to believe. What we have here is an excellent beer. Coffee fanatics (which I am) would absolutely love this. I just wish it was more creamy and had a bit more of those chocolate hints to the taste. This is another beer from Scot at http://blog.twobeerdudes.com/ that I have been looking forward to. Heres to hoping it lives up to the great things I have heard about it. Beer #95 is Founders KBS by Founders Brewing Company. 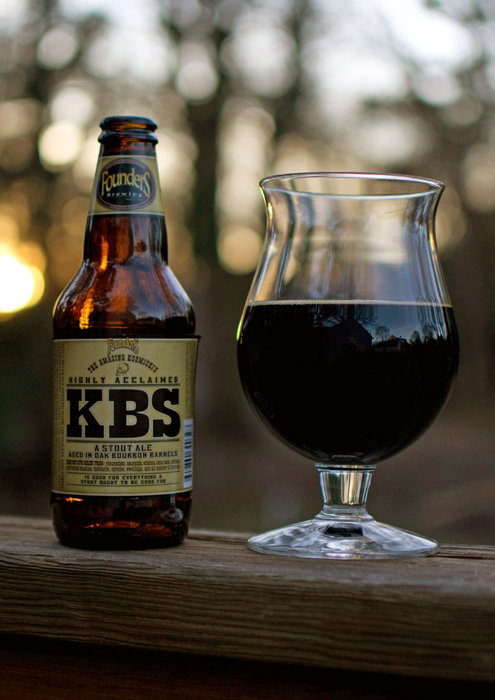 KBS stands for Kentucky Breakfast Stout. Stout for breakfast? Sounds OK to me. A Kentucky Breakfast Stout from Michigan? Why not. This American Double/Imperial Stout has a hefty ABV of 11.2% and is aged in oak bourbon barrels. Would you be surprised if I told you this brew was a dark brown, probably black, with a very little brown head? Well it was and that dark liquid smelled like chocolate, some vanilla, coffee, roasted malts, and a bit of alcohol. It was a wonderful aroma indeed. All of those aromas were distinctly found in the taste. Add a bit of alcohol warming sensation and an aftertaste of chocolate with a creamy smooth slightly sticky mouthfeel and you have one fine drink. Even with the high ABV, this is fairly easy to drink and I think should be enjoyed nice and slow. “So take me down slow and easy”…sorry, I started singing an old Whitesnake song there. Good thing you can’t hear me sing but I think I sound wonderful but that just may be the KBS talking. Not much more to say about this other than it was absolutely delicious! I wish I had another right now. Highly recommended…grab it if you can and enjoy!